And we’re back. After a week and change in Merry Old Ingerland (Did I miss anything? Something about a global economic meltdown? ), I’m back in the United States of Freedom and ready to sign. I’ve got plenty of Eagles-related nonsense ready to spew forth, but I thought I’d start the weekend with an off-topic post in re: my trip last Saturday to see the other football over in London. 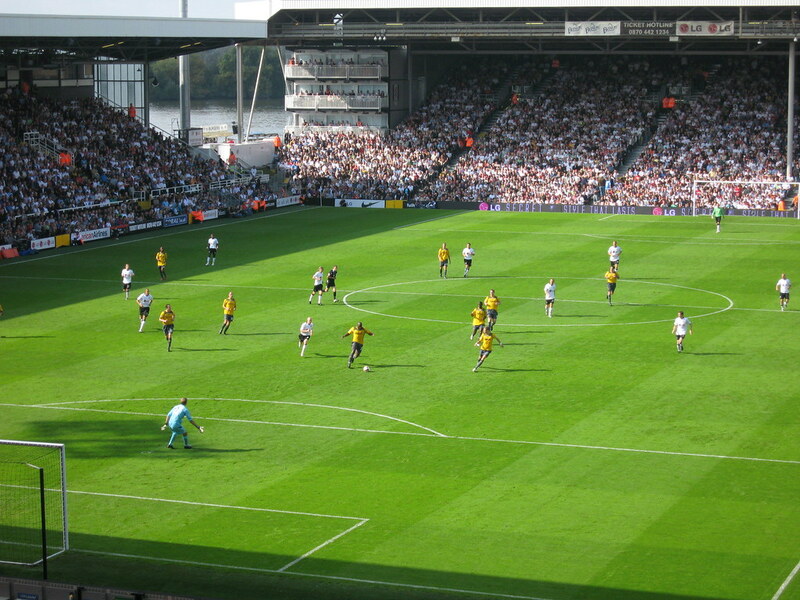 In another blog life, I’m actually pretty into the whole soccer thing as well, and was pretty psyched to score a ticket to see Fulham host Bolton Wanderers in a Premiership match at Craven Cottage. In terms of hooliganism, Fulham - Bolton isn’t exactly Among The Thugs. You can still find football matches in the UK with a bit more of an angry bent to them, but Fulham - Bolton isn’t one of them. 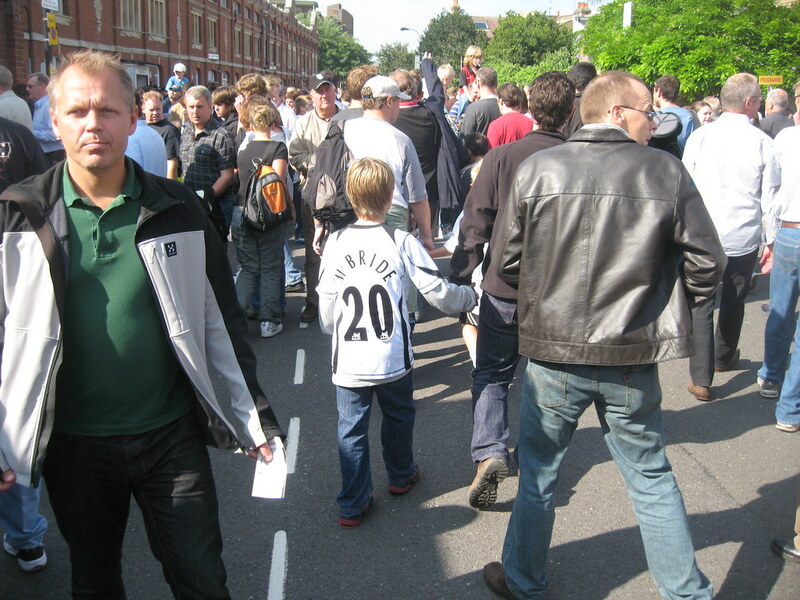 Neither team has a particularly psychotic fan base, there’s no rivalry between them, Fulham’s in a relatively nice neighborhood, and it was like family day or something (they were painting kids’ faces outside the ground). So no fears about getting knifed for having the wrong scarf. It was more like a Houston Texans - St. Louis Rams game. Only a lot smaller. Speaking of smaller grounds. There are some gigantic stadia in England (Old Trafford, the new Emirates stadium, Anfield, City of Manchester Stadium), but for the most part, these are not the cathedrals to which your average NFL fan has become accustomed (see here for a list by capacity). 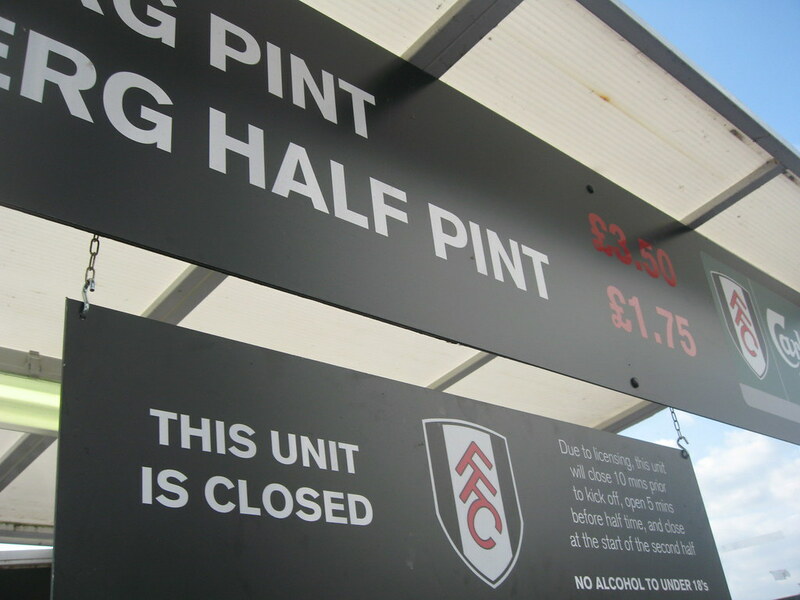 Craven Cottage is listed as pretty small (22,000 and change) and it felt that way. I mean, it was nice and intimate and all that, and in a lovely spot on the Thames, but it’s not the Linc. It does give you some perspective on just how crazy it is to have these ridiculous NFL stadia (most built in the past 15 years) that are really only used 10-15 times a year. Also, in that context, it’s offensive that we don’t yet have another World Cup on the books for the US and A. Yes, I’d like eight pints of Carlsberg, please. So they stop selling beer ten minutes before kickoff, resume five minutes before halftime, and then cut off again for good at the end of halftime. Beer is extremely reasonably priced (3.50 GBP) and, wait for it, there’s no limit to the number you can get at once. The dude in front of me at halftime ordered eight (8). No joke. No Americans got in the game. Fulham had five Americans on the roster last season, but a regime change in management trimmed that number to one for this season, Clint Dempsey. Unfortunately, Dempsey didn’t get in the game, which I’ll chalk up to having played at midweek for the United States. Now let us get back to the proper football, as they say. The “number two guy”? That implies there’s a chance he could play! Sweet. It’s always been a dream of mine to attend a Premiership match. I’m a big Liverpool fan.